Home/Featured/Michael Weinstein and AIDS Healthcare Foundation Runs Anti-PrEP Ad, Dismisses CDC, and All Other AIDS Orgs. Michael Weinstein, the outspoken president of the Los Angeles-based AIDS Healthcare Foundation and his organization is still standing alone and stubbornly campaigning against PrEP and Truvada the daily medication that has been shown to greatly reduce the risk of contracting H.I.V. The mystery is why l Weinsteinand the AHF is so against a clinically proven prevention drug and why they continue to battle against alone. “There’s no large controversy; there is one loud voice,” said Charles King, the president of the H.I.V. nonprofit Housing Works and a co-chairman of an anti-H.I.V. task force appointed by Gov. Andrew Cuomo of New York. Mr. King called the A.H.F. 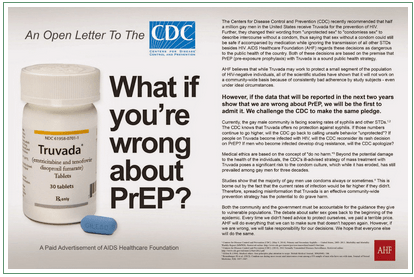 ad “a direct attack on New York State’s efforts to end AIDS as an epidemic.” The growing pro-PrEP chorus includes government bodies like the World Health Organization and the Centers for Disease Control and Prevention; various state and local health departments, including in New York and San Francisco; and most H.I.V.-related nonprofits that have taken a stance. Mr. Cuomo has made PrEP one of three planks in his anti-AIDS plan. Mr. Weinstein’s vociferous opposition to PrEP has made him perhaps the most hated man in the AIDS business. “I consider him a menace to H.I.V. prevention,” said Peter Staley, a veteran activist who also serves on the Cuomo task force. James Loduca, the vice president for public affairs at the San Francisco AIDS Foundation, compared him to a “climate-change denialist.” For his part, Mr. Weinstein insists he’s not really alone. He says “a majority” of H.I.V. experts he speaks with privately agree with his view that PrEP is an ineffective public health intervention, but they do not want to talk publicly. or his part, Mr. Weinstein insists he’s not really alone. He says “a majority” of H.I.V. experts he speaks with privately agree with his view that PrEP is an ineffective public health intervention, but they do not want to talk publicly. “I think that people are intimidated,” he said in an interview. “When they see how mercilessly anyone who speaks out on this is attacked, I think it has a chilling effect.” He attributes the chill to AIDS activists in thrall to Gilead, Truvada’s manufacturer, which provides support for AIDS nonprofits. Herein lies the problem. Weinstein is on the record stating that Truvada works and there are some whispers in the community that Weinstein and AHF’s attack on Truveda is nothing more than retaliation against Gilead from pulling funding from the organization. Or is it nothing more than Weinstein’s vested interest in protecting his position in the HIV-prevention community. In either case is that really worth people’s lives? Because that is going to be the cost if the ludicrous and self-glorifying campaign he is running, almost entirely on his own is successful.